This article will introduce how to expand system partition on Windows SBS 2003 in an efficient way without any data loss. Download IM-Magic Partition Resizer Server to extend SBS 2003 system partition, which is 100% safe and reliable. Can You Extend System Partition SBS 2003 with Diskpart? Is it able to extend boot volume with diskpart command? Well, on Windows SBS 2003 the disk management enables you to resize partition but just not the system partition so does the power of diskpart. IM-Magic Partition Resizer Sever enables you to extend disk partition on all Windows Server operating system without moving or deleting any data from the partition. With the user-friendly interface, you are able to extend system partition on SBS 2003 easily within a few steps. 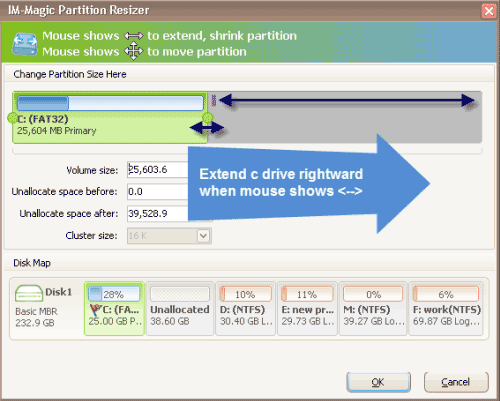 Right click a partition that has large free space and choose "Resize/Move" option after launching the software. Shrink the partition by moving the arrow to the right part and produce unallocated space. Right click the system partition and choose "Resize/Move" option to gain the free space. 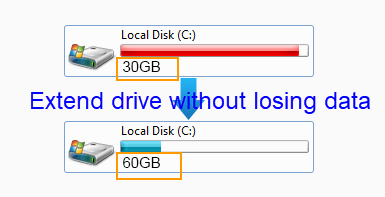 Note: If there is partition between c drive and the unallocated space, just right click the partition in the middle and then move it to the right. IM-Magic Partition Resizer Server - Windows Server 2003, 2008/2012/2016 partition resizing software.